Today’s guest post is written by Andrew Garnett-Cook, a 7th and 8th grade social studies teacher in Brookline, MA. This past December, I took three days away from teaching to be a co-presenter for Listenwise at the National Council on Social Studies Conference in Washington D.C. I was really excited to meet other Social Studies educators to discuss the value of using public radio stories in teaching, for developing listening skills as well as social and global literacy. Over these three days, I was rejuvenated by informal conversations and was reminded anew of how much teachers across the country hunger for new ways to engage their students in the value of learning about the past. I, myself, have discovered new and meaningful ways to engage my students in learning about the past, especially using Listenwise curriculum-aligned stories. 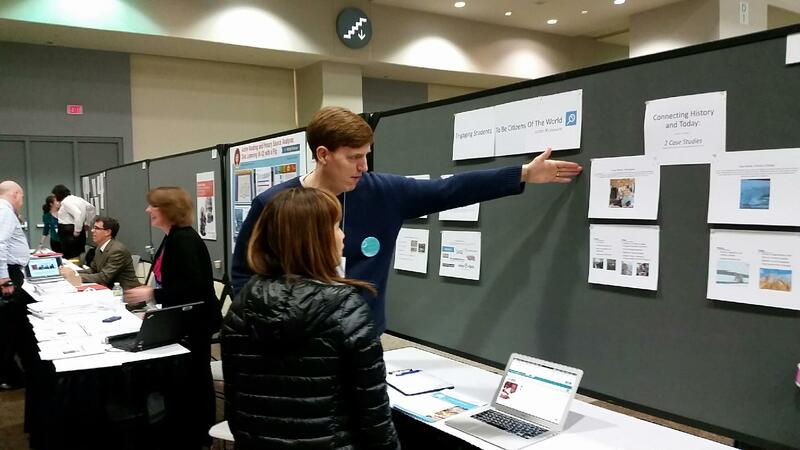 During the conference we presented two stories that educators can use to connect the past to present-day issues. The first story, entitled “Insight Into What It’s Like to be a Refugee” is about a Doctors Without Borders traveling exhibit designed to put people in the shoes of a refugee. The story offers rich opportunity to engage students in a range of topics in American history and places the listener in the shoes of a Syrian refugee. Among things the listener is asked to ponder is what possessions he or she would take if there was little time to decide and you could only select a small number of items. A thought experiment like this helps foster empathy for the displaced. Also, a story like this one can be used in a number of different places in a U.S. or World History curriculum. Topics where this story could connect well include the Jewish Refugee crisis in World War II, Chinese exclusion, or even the expulsion of Jews from Roman Palestine in the 1st century. The themes that tie them all together (being a stranger in a strange land, the impact of war on civilian populations) are ones that transcend time periods. They are universal human experiences brought into your classroom. The second story, entitled “Climate Change and Human Migration” also presents an exciting opportunity to connect human experiences across time. The story presents new research to help answer the question of why our human ancestors left Africa in prehistoric times. This story fits nicely in an Early Humans unit but it can also be used in science curriculum as well. Through this story, teachers can engage students in larger conversations about the uncertainty of what is known about the past and how new evidence can fundamentally change our understanding of what happened. It also helps open conversation about the impact climate change has had on the human experiences over thousands of years and what its implications for the future might be. The challenge for any social studies teacher is to figure out ways to make the past relevant to our experiences today. This is not easy. However, public radio provides a lot of opportunities for teachers to bring current events and new research into classes. Are you finding new ways to teach history within the context of current events? Share what you are doing in the comments below. Find our slides from NCSS here.